The summer of 1971, I was working the night shift for Conoco Oil Co. at an open pit uranium mine west of Karnes City Tx. I was one of 6 people operating Caterpillar 657B earth movers. We were down to about 210 feet deep when this incident happened. It was about 11:10 PM , just after shift change we were getting ready to crank our machines, when the 85 acre pit lit up as if it was daylight. The light was so bright that I had to squint because it hurt my eyes. I remember hearing a high pitched hissing noise and the hair on my arms stood on end. I was so scared, I fell to the ground and started praying. I remember trying to look up, but the light was so bright I couldn't. After about 2 minutes, the light started getting dimmer and I could finally look up at it. What I saw amazed me. 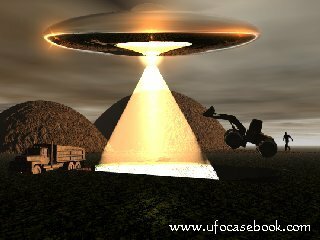 The object was round and the bright light was coming from the center of the bottom of the UFO. Around the perimeter of the craft was hundreds of penlight size light beams that alternated in all colors of the spectrum. Now I know they were laser beams. The UFO was rising up slowly at first and then went straight up out of sight in about 10 seconds. I was crying and shaking and so was everyone else. The other shift workers thought we were crazy when we told them what had happened. But we got the last laugh. This is how we proved it actually happened. (1) A geologist with a geiger counter flies over the area and finds the highest radiation reading. (2) Drilling trucks are sent out and core samples are drilled to determine the highest concentration of uranium ore. These core samples are drilled in a grid pattern and every core sample is given a tracking number and logged in showing the concentration and amount of uranium present. (3) The open pit mine is then laid out according to these core samples. When this UFO incident happened, we were about 2 feet away from a layer of hard rock called the "tap rock" that laid directly on top of the uranium ore. The uranium ore varied in depth from 6 to 18 inches and had about the same brown color as low grade coal. Two days after this incident, the tap rock was removed to expose the uranium ore. We were astounded to find that the uranium ore was now a chalky white substance that had NO radioactivity at all! There was a 250 foot diameter circle of this chalky material in the center of the pit. Outside of the circle, the uranium ore was still as potent as before the incident. Core samples don't lie. This chalky material was uranium before this incident. Many a night I have laid in my bed thinking about what happened. I think the UFO needed the uranium for some reason.